Archaeologist Who Uncovered China's 8,000-Man Terra Cotta Army Dies At 82 : The Two-Way Zhao Kangmin reconstructed the first warriors after farmers digging a well stumbled on fragments in 1974. They were commissioned by China's first emperor — to guard his tomb. 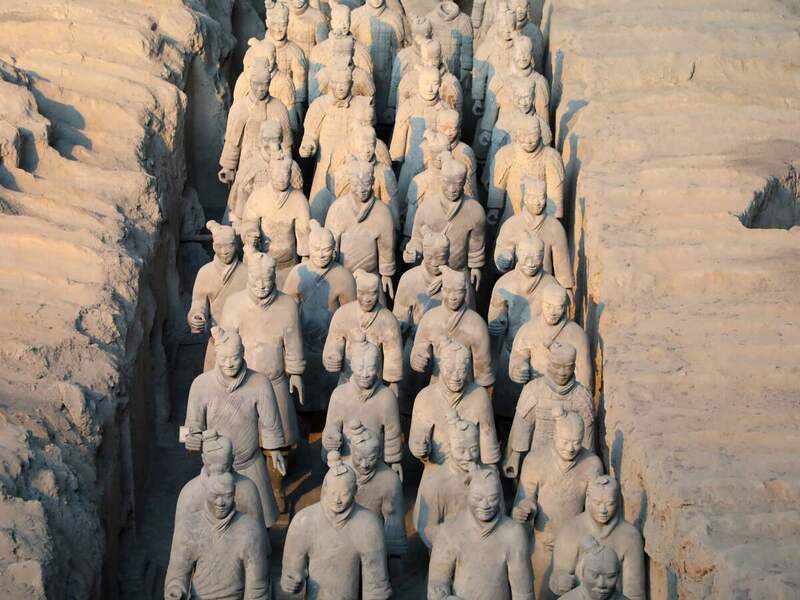 Lifelike clay soldiers at the Museum of Terracotta Warriors and Horses in Xi'an, northwestern China. The first figures were reconstructed by archaeologist Zhao Kangmin, who died Wednesday. They had no idea what they had found — an army that had been interred for more than 2,000 years to guard China's first emperor. The farmers contacted Chinese authorities, who sent out government archaeologists, reported National Geographic. "Because we were so excited, we rode on our bicycles so fast it felt as if we were flying," Zhao reportedly stated. The archaeologist found heads, torsos and limbs. He began to reconstruct a figure, piece by piece. Each warrior was life-sized, with a different face and expression, and details that were realistic down to the fingernails. Eventually more archaeologists would uncover standing and kneeling archers, infantrymen, armored officers and chariots with horses. At the time, Zhao grew nervous about the warrior he was restoring, according to historian John Man who wrote The Terra Cotta Army. He was "nervous that he might be swept up again by the madness of the Cultural Revolution, whose teenage Red Guards had forced him to criticize himself for being involved with old things and therefore encouraging the revival of feudalism." The emperor who united China in the third century B.C., Qin Shi Huang, had commissioned the army to protect his tomb. More than 700,000 people built his soldiers and burial site, archaeologists estimate. In more recent times, the terra cotta forces have allowed archaeologists to learn more about the Qin Empire. Based on the damage of the clay, they believe that the dynasty collapsed suddenly, Smithsonian reported. Rebellious forces may have raided the pits where clay soldiers stood sentry, setting fires, striking down warriors and stealing their real weapons. Nearly 600 sites within some 22-miles have been identified, amounting to the largest tomb in Chinese history, according to UNESCO. Farmers have since sued the government for recognition of the discovery. But Zhao didn't think they necessarily deserved credit. "The farmers saw the terracotta fragments, but they didn't know they were cultural relics, and they even broke them," he told China Daily in 2009. "It was me who stopped the damage, collected the fragments and reconstructed the first terracotta warrior." The publication reported that even after he retired from his role as curator at a museum in Xi'an, Zhao would go the museum every day and sit beside four terra cotta soldiers and a horse that he had reconstructed in the '70s. In that display room, he would write autographs that read, "Zhao Kangmin, the first discoverer, restorer, appreciator, name-giver and excavator of the terracotta warriors." He died at age 82.